Dr. Duong completed the UCLA Affiliated Training Program in Gastroenterology in 1998 with and extra year in ERCP. He graduated from University of Massachusetts Medical School in 1992 and completed his Internal Medicine residency at University of California - Irvine in 1995 and has been in private practice since 1998. 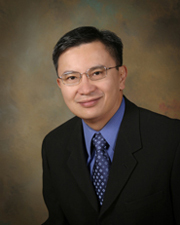 Dr. Duong is married with 2 children and has been in our wonderful desert area since 2002.